There can be little doubt that H.G. Wells was one of the most important writers in the history of science fiction. Nevertheless, for an author who produced up to four or five books every single year for fifty years, the science fiction that has stuck in our memories, the novels that shaped the entire genre, all date from a relatively brief period right at the start of his career. Between The Time Machine (1895) and First Men in the Moon (1901) he wrote a handful of novels that survive to this day, indeed that should still be required reading for anyone with even a passing interest in science fiction. And after that? What we remember from his prodigious output in the twentieth century are the acute social comedies, Kipps , Tono-Bungay , The History of Mr Polly , and the non-fiction, such as The Outline of History , which was probably the most successful thing he ever wrote. But in general readers of science fiction might have a vague awareness of his involvement with the film Things to Come , and no more. In fact, Wells continued to write scientific romances throughout his career, and remained up to date with what else was being written in the genre (there are references to the novels of Olaf Stapledon in the book under review, for instance). But with the new century he seemed to become less interested in the machinery of science fiction (when he needed to send a contemporary Englishman to a distant future in The Sleeper Awakes , for instance, he didn't use a time machine but put him into a coma), and more interested in the nature of the future society. Practically every scientific romance he wrote after 1901 was, to some degree or other, a utopia— A Modern Utopia (1905), In the Days of the Comet (1906), The World Set Free (1914), The Open Conspiracy (1928), The Shape of Things to Come (1933), and so on. These all followed something of the same pattern: a disturbing pessimism about the immediate future, and a profound optimism about the distant future when mankind would be ruled by a highly educated elite that he tended to refer to as "samurai." 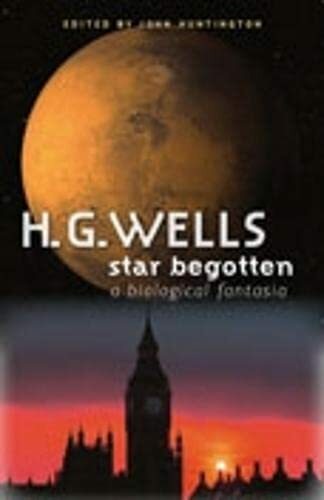 Star Begotten , a short novel first published in 1937, can be read as a comment on all of this, a knowing novel about science fiction, and also as a satire on the state of the world in those dark days when everyone knew they were drifting towards war but nobody seemed able to do anything about it. It is also a science fiction novel in which nothing science fictional actually happens. Our typically Wellsian protagonist, Mr Joseph Davis, is a little man of impeccable middle-class upbringing. He has been taught everything he needs to know about religion (Wells would give Richard Dawkins a run for his money as a debunker of religious belief) and about leaving the running of the world to those noble souls best suited to the job. If he has doubts he puts them down to lapses in society, a failure to recognise the heroism of those who have gone before. So he makes a good living now as the author of highly successful and jingoistic popular histories. But the doubts don't go away, and they become more persistent when his wife, Mary, a highly intelligent woman from whom he seems to be becoming more and more detached, decides that she wants to have a baby. The onset of fatherhood is what makes everything different for Joseph Davis. In his club one day he joins an erudite conversation about contemporary scientific knowledge when the subject of cosmic rays comes up. One person suggests that they come from Mars. A more eminent professor immediately dismisses the notion (all the way through this book Wells is careful to ensure that any spurious scientific notion is immediately shot down; it is not the notion that matters but the belief) but is ignored, and the idea lodges with Mr Davis. And it is not any Mars emitting these rays, but the one from "a book called The War of the Worlds —I forget who wrote it—Jules Verne, Conan Doyle, one of those fellows" (p.62). Along with references to Stapledon and others, remarks such as this, scattered throughout the novel, are enough to convince me that one of the multiple targets of Wells's satire is science fiction itself. But more broadly his target is anyone who allows themselves to act upon belief rather than knowledge or experience, whether that belief is instilled by religious or political leaders. These advanced, cold, antagonistic Martians are transmitting cosmic rays at the world precisely to change our genetic make-up, to turn us all into Martians in advance of their next invasion. Or so Mr Davis comes to believe, and he convinces Dr Holdman Stedding of this idea, who in turn convinces Professor Ernest Keppel. The scene in which Stedding and Keppel discuss the cosmic rays is a little comic masterpiece, progressing exactly as so many cod histories such as The Holy Blood and the Holy Grail have done: suppose that ... if we imagine ... let's say for the moment ... we might as well call them Martians, for want of a better name—and suddenly a notion that neither man is quite certain about acquires a strange and inarguable solidity. And so the idea spreads. At one point the illustrious and mad owner of a national newspaper gets hold of the idea and is about to plaster it across his papers until another story comes along. There are no Martians, and no cosmic rays—Wells is at pains to make that perfectly clear. But this is a novel about ideas, and the spread of ideas, and as such is both a neat social comedy and an effective scientific romance. And because it looks at how mankind might be changed for the better (by the end of the book we see that Joseph and Mary and their unnamed child have been changed by the rays even if they do not exist), it fits in with the utopian impulse of so much of Wells's writing. This excellent new edition, part of Wesleyan's "Early Classics of Science Fiction" series, comes complete with all the apparatus that implies: useful and informative notes, details of variations between the different editions, and above all an invaluable essay by editor John Huntington. But that should not make it seem like a book for the scholars. Star Begotten is an often forgotten novel that really deserves a much wider audience.